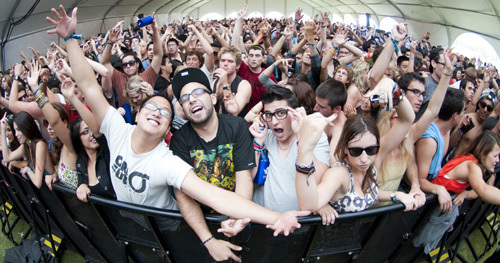 Whether you’re looking for the perfect party school, or you’re an old-timer who likes a music festival and to relive your carefree collegiate days, music festivals are the best–particularly when they’re put on by a university. 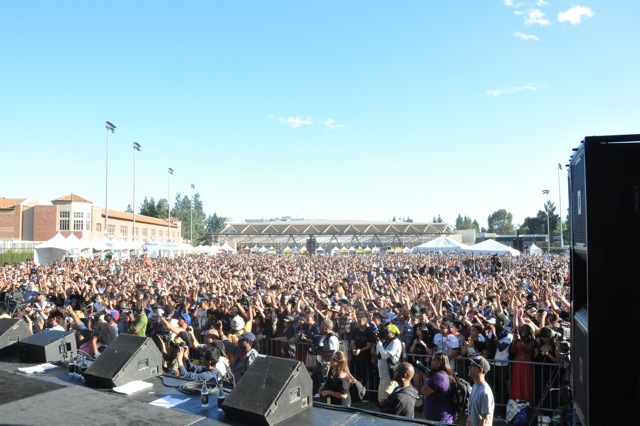 With spring here again, and the need to get outside, or let loose before exams begin, we decided to come up with a list of the 10 best music festivals on college campuses in the nation. From crawfish in New Orleans, to sustainability in Cali, here are our favorite ten college music festivals. The premiere University in a town known for festivals doesn’t disappoint with the yearly Crawfest. Complete with unlimited crawfish (18,000 lbs were served this year), unlimited water and sodas, and access to local food and art vendors, Crawfest is a great way to spend a spring day drinking some brews and gorging yourself on some all-you-can-eat seafood. Though this festival doesn’t sport big name headliners, New Orleans has a pretty fantastic local music scene, and student bands are occasionally seen as well. This second festival in a young southern town is also open to the general public. Located on Vanderbilt’s campus, this event often has a few national acts, and draws from regional and local Nashville musicians. Recent years have seen Kid Cudi, the Flaming Lips, and Drake perform at Rites of Spring. Oh, and the food trucks are great. This particular event stemmed from a movement towards an “open campus” in the 70’s, when college administrators were seeking a way to get the local community engaged with Vanderbilt. University of Ohio teams up with the city of Athens, OH to offer students and the public not just one festival, but a ton of them. All the main streets in Athens choose a night to hold a festival. People flock to the street, enjoy the springtime and see some great acts. At the end of the street fests, a larger festival is hosted on OU’s campus. Last year Kendrick Lamar and Steve Akoi played. UPenn bills it’s Spring Fling out to be the biggest college music festival on the east coast, with over 10,000 students and visitors attending last year. This party right before finals lasts through the day with local and larger bands, inflatables, and food vendors. The party continues into the night with live DJ’s. UCSD’s Sun God Festival is a fun yet more conscientious version of some of the other festivals on the list. The event helps to fund local FM 94/9’s “About the Music” fund, that directs donations for music to local San Diego schools. The Sun God Festival also asks that students only bring or buy reusable water bottles, in an effort to remain environmentally conscious. Sun God has a wider variety than most of the festivals on our list, from DJ battle winners to comedians, and a number of DJ’s. On the second day of the festival, Recess–an ideas and music festival–has a number of events: from a pitch competition to networking, offering a chance to get yourself out there while enjoyed some tunes. The Ivies weekend continues the over 150-years-old Ivy Day tradition, and through a number of transitions it remains one of Bowdoin’s hardest drinking celebrations. Originally a day when ivy would be planted with the coming of spring, today Ivies weekend is more of a weekend long party before students head into finals studying. Recent years have had a number of fun acts including Matt and Kim and Passion Pit. Cost: Free for students, faculty, $20 for graduate/professional students, more for public. Slope Day began in 1901 as “Spring Day” and for the next half century ranged from variety shows to circuses to mock bullfights. Current music festival format began in the 20’s and continued on and off, with Duke Ellington playing in 1947, and the Grateful Dead played ion 1977. Alcohol is allowed around the perimeter, or for a maximum five beers inside the gated slope area–so perhaps Slope Day is a bit less of a party than other festivals on our list, but it does have some pretty great music. Featured artists have included Kanye west, Ben Folds, Snoop Dogg, and Ludacris in recent years. UCLA’s Jazz Raggae festival has something for everyone with one day for “Jams” and another for Reggae. From Snoop Dogg to lesser known and local projects, this festival already stands apart by not necessarily focusing on mainstream acts. Like the Sun God festival above, Jazz Reggae festival takes sustainability seriously, and will have water re-filling stations, as well as recycling throughout the event. The goal is to lower the carbon footprint of the event even lower than last year. For those of you who enjoy busting out some neon clothing and raving for 72 hours, or just some southern hospitality and Austin, this event might be for you. Put on through fraternities and sororities at UT Austin, a few dollars at the door of Greek buildings gets you in for food and to see local and national acts. The best part, entrance fees go to the charity funds of Greek organizations. From artsy RISD goers at Andrew Bird and Dan Deacon, to a Friday Night with Chance the Rapper and R&B legend Lauryn Hill as a headliner, this year’s spring weekend had something for everyone. With the student newspaper reporting that they were able to secure artist who each hit a huge portion of the student body in some way, this is a great festival to crash as well, as each student can invite up to two guests to come along.